A fisheye lens can see wider than any other type of lens. Lens designers spend much of their time ensuring that the natural tendency in optical lens combinations to exhibit geometric distortion like barrel distortion (where vertical and horizontal lines curve outwards) or pincushion distortion (where the lines curve inwards) is minimised. Such lens designs are rectilinear; straight lines are reproduced as straight lines. A fisheye lens is completely the opposite and known as curvilinear. Why are they called fisheye? Curvilinear lenses typically comprise a large dome-shaped front element, which resembles an eye of a fish. More importantly, a fisheye lens usually has a very wide angle of view. The most definitive form of fisheye lens can record detail from a 360° view of 180°. That view is recorded as a circular projection onto the frame, and a lens that manages this is called a circular fisheye. These are relatively rare and most fisheye lenses are of the full frame variety. 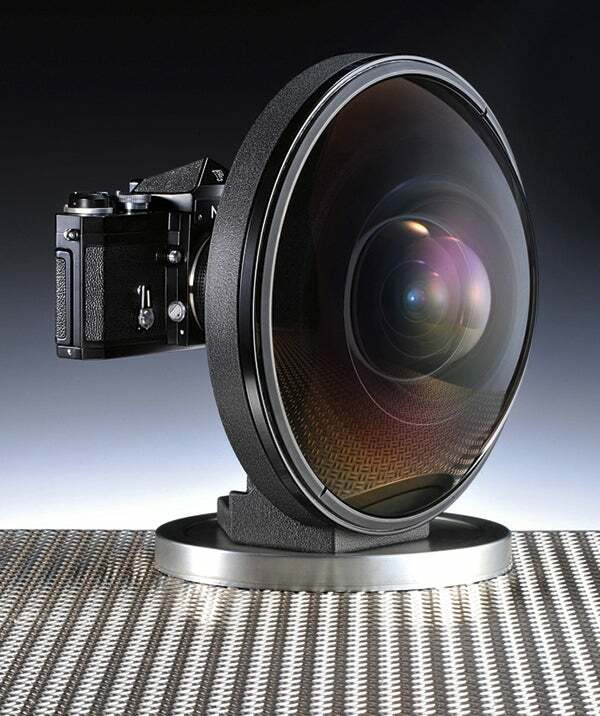 So-called true fisheye lenses have a 180° angle of view, while many fisheye conversion lenses that fit onto the end of normal rectilinear lenses see a less wide field of view and retain curvilinear distortion. Some fisheye lenses, like the rare Nikkor 6mm f/2.8 built in small numbers in 1972, have a field of view exceeding 180°, meaning the lens can see behind itself. In the case of the Nikkor, the angle of view recorded is 220°. With digital post-processing it’s now possible to convert curvilinear images to rectilinear with ease. The rise of the action camera has popularised fisheye lens use and a new generation of fisheye cameras is emerging, producing rectilinearly corrected images and video in real time.